Title: DM&IR 200 at Collingwood. Description: 1530 Proctor switch pulls commercial cars from interchange back to Proctor MN. Description: Rolling by in Run 8 on a hot summer day. 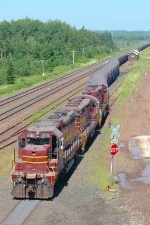 The 200 rolls back to Proctor MN with commercial cars from the BNSF. Title: DM&IR 200 in Proctor Yard. Description: The 200 heads down yard track 54. Title: DM&IR 200 weighs its train. Description: The 200 with train U717 slowly rolls across the scales in Proctor Yard. Description: Limestone load entering Proctor yard. Description: A pure set of Missabe painted SD38s pull a loaded limestone train back to Proctor. Description: Two SD38s lead a loaded crude ore train through Iron junction enroute to United Tac. Description: DMIR 200 awaits transport to the deadline at Homewood Yard. During the wait it received a rest at Stevens Point.